I work five days a week, and my nights are spent around Los Angeles bars, clubs, and small theaters doing stand-up comedy. That means I get two days each week to relax. Actually, on Saturdays I’m hungover. One day to relax. What did I do this past Sunday? I woke up at 5 a.m. to make pierogi. The sad part is I’ve been doing this for as long as I can remember. Every week on this unholy day, when my eyes pop open and it’s still dark, I get to work on some painstaking from-scratch project that I’ve decided to undertake because I hate myself. If it’s not pierogi, it’s tortellini en brodo or some multistep recipe for wedding soup. Nobody’s making me do this, by the way. I’m my own boss and I’ve decided to work myself into the ground. Sunday is not a day of rest; it’s a day for punishment. That’s the thing about being a skilled home cook nowadays: There’s not really time for it. You have to want it. It’s not my job to be learning about food anymore. Nobody’s paying me to work on my knife skills or infuse oils at home. Time is valuable, I’ve heard. I spend what little of it I have spreading myself absolutely thin. So many of the comments on these recipes are suggestions like, “Buy a pressure cooker!” and “Frozen meatballs taste just as good, idiot!” While these comments make me want to fast pitch all of my wine glasses against the side of my neighbor’s house, I do understand them. I imagine that from your perspective, spending four hours in the morning crimping pierogi seems like a colossal mismanagement of time. I tell myself that being in the kitchen is relaxing, but I’m not sure that’s true. People always say that, by the way—that cooking is this therapeutic activity that calms the nerves and lets your mind drift. Let me tell you something, pal: My mind would be drifting just fine if I was high as hell on a beach right now. I don’t need to feel the eggy, floury residue of pierogi dough underneath my finger nails to achieve some sort of enlightenment. I don’t cook on Sundays to visit the celestial plains. I cook because I’m a prisoner to this type of project. This past Sunday, I didn’t go to the park, or go on a date, or get brunch with my friends. I made Polish food alone. In the end, you make time to get good at the things you think are important. Me? I think it’s important to get good at pierogi. Pierogi are one of those dishes that will reap huge rewards if you make it right. Meaning, depending on where you live, you can probably make them better than any restaurant. I often find pierogi to be bland, the victim of poor seasoning and not enough of the right ingredients. Mashed potatoes wrapped in dough doesn’t exactly scream haute cuisine. Polish food is seldom treated as fine-dining, at least stateside, and I like that about it. It’s a lot of sour cream and butter, but if you use the right amount of seasoning and a few herbs, you can easily push this dish to its limits. 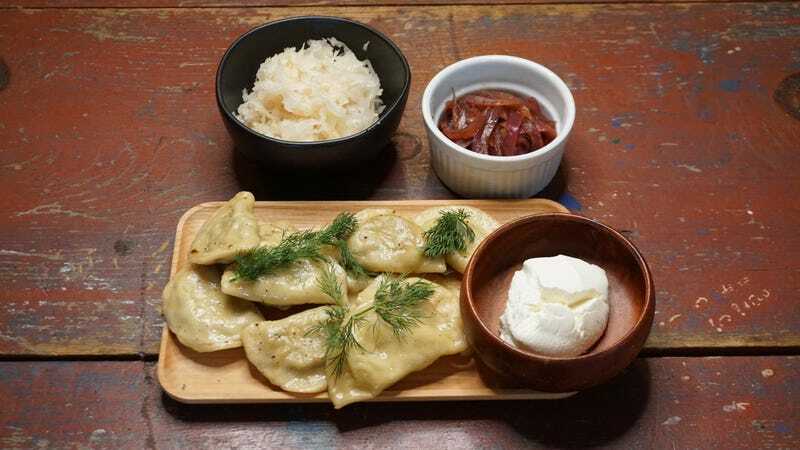 I’ve included three fillings that are my holy pierogi trinity: 1) dry cottage cheese and dill, 2) mushroom, and 3) potato (I like to treat sauerkraut as a condiment). I can’t always say this when I cook something, but the pierogi I have made were the best I’ve ever had, and it’s not even close. Finally, I’m free. If pasta dough is flour and eggs, pierogi dough is flour and eggs plus sour cream. Make a well just like you would do with pasta dough and knead for 10-15 minutes until smooth. Wrap in plastic wrap and let the dough rest for 30 minutes. If you can buy dry cottage cheese, great, but if not it’s easy to make at home. Take the cottage cheese and rinse it in a strainer or fine mesh sieve, then cover it in cheesecloth or put paper towels over top. I let the strainer sit overtop a bowl and put some sort of weight (I’ve used actual weights here, but any heavy container will do) on top. Let it sit in the fridge for up to four hours so that the moisture releases. Sauté about half a bunch of green onions, sliced thin, in a pan until fairly soft. Add this, the cream cheese, egg, and a few ounces of fresh dill (I used exactly five) to the dry cottage cheese. Add salt and pepper. Incorporate well and refrigerate. The ratio for the potato filling is 1 to 1. Easy stuff. Just mix well. Sauté the butter and onions until soft, then add the mushrooms. Cook all the moisture out of the mushrooms (about 7-10 minutes over medium heat) then add about a tablespoon of finely chopped fresh rosemary. Rosemary isn’t exactly pierogi canon, but it goes well with mushrooms. Make sure to salt and pepper. Once the mixture cools, incorporate the sour cream. Refrigerate. To make the pierogi, I take sections of the dough and run it through my pasta machine. If you don’t have one, you can use a rolling pin to create flat sheets of dough like you would for ravioli. You need something circular that is about 2-3 inches in diameter to cut holes in the dough. I use a big canning jar. Once you have your circles, place a little dollop of filling in each one. I dip my fingers in cold water and dab the edges of the dough so that it seals nicely. Fold in half, pack the filling in, and use your fingertips to pinch, seal, and crimp the edges. I boil these for about four minutes, then sear them in a hot pan on both sides with butter. To me, that light sear is important. It adds necessary texture to the dough. You’ll get a nice balance between the crispy pierogi and soft filling. Salt and pepper again. I serve them with sauerkraut, sour cream, and red onion agrodolce. Happy non-lazy Sunday.